"Before disco, and before the transcendent echoes, Arthur Russell wanted to be a composer. His journey began in 1972, leaving Iowa to study Indian classical composition with Ali Akbar Khan in Northern California and ending two years later in New York at the Manhattan School of Music. In that brief period Arthur met and worked with several musicians and poets that would guide his work throughout the remainder of the decade: Allen Ginsburg, Christian Wolff, Jackson MacLow, Rhys Chatham, Philip Glass, Elodie Lauten, and Ernie Brooks. 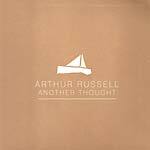 First Thought Best Thought collects Arthur Russell's out of print instrumental and orchestral compositions along with over 45 minutes of previously-unreleased material on two CDs. Initially intended to be performed in one 48 hour cycle, 'Instrumentals' was in fact only performed in excerpts a handful of times as a work in progress. The legendary performances captured live in New York at The Kitchen and Franklin St. Arts Center include the cream of that era's downtown new music scene including Ernie Brooks, Rhys Chatham, Jon Gibson, Peter Gordon, Garrett List, Andy Paley, Dave Van Tiegham, and Peter Zummo. Included here is the previously unreleased 'Instrumentals' Vol. 1 along with 'Instrumentals' Vol. 2 that has been out of print for over twenty years. Originally released in 1984, sections of 'Instrumentals' Vol. 2 were incorrectly mastered at half speed, and have been now corrected for this compilation. 'Reach One' is one of Arthur's earliest compositions dating back to 1973. The hypnotic soundscape was written and performed for two Fender Rhodes pianos, and is previously unreleased. One of the holy grails in Arthur's discography, 'Tower Of Meaning' is a beautiful and stunningly moving orchestral work. Conducted by the late Julius Eastman, 'Tower Of Meaning' was originally released in a limited private edition of only 320 copies. 'Sketch For The Face Of Helen' shares only the same title as the previously released excerpt from 1981. Inspired by his work with friend and composer Arnold Dreyblatt, this previously unreleased version was recorded with an electronic tone generator, keyboard and ambient recordings of a rumbling tugboat from the Hudson River. 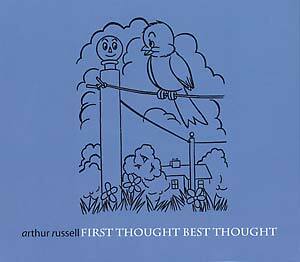 First Thought Best Thought is an essential collection of the lost instrumental treasures from Arthur Russell's vast archive and brings the genius of his legacy closer into focus. Packaged with a 16-page color booklet + O-card of archival images and essays by former Modern Lover Ernie Brooks and Audika's Steve Knutson."